Mobicip | Connection Error.! Try Again.! 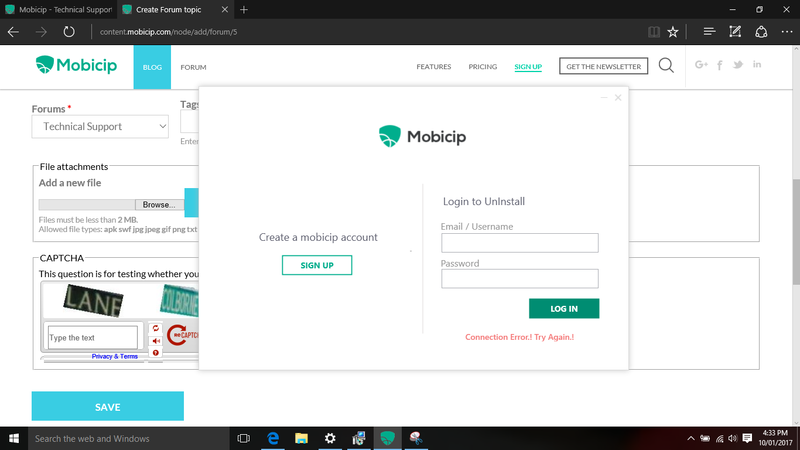 I am trying to install Mobicip onto my sons 64bit windows 10 Asus laptop. After downloading and install the software, I try to login but recieve the error "Connection Error.! Try Again.!" There is no problem the the PC internet connecction. I tried to uninstall and reinstall but of course you need to login and enter your password to do that, at which point I recieve the same error above. Pleae can I have some assistance. Re: Connection Error.! Try Again.! We believe that this issue needs further investigation and maybe a scheduled phone call to troubleshoot further. So, please send an email to our Email support with your contact number and registered email id and we will investigate further asap. Hello, I'm having the same problem as above..it say's Connection Error!, but my connection is fine. A temporary glitch in our server could have caused this issue. Please try and see if the issue is resolved now. If it still persists, send an email to our Email Support via your registered id as suggested in our previous post and we will investigate further.